Last week Broadway was closed to vehicular traffic at night so workers could continue the installation of the fourth and final track. You can see what they accomplished. When it's done, the Wilson station will be a full Red and Purple Line transfer station. 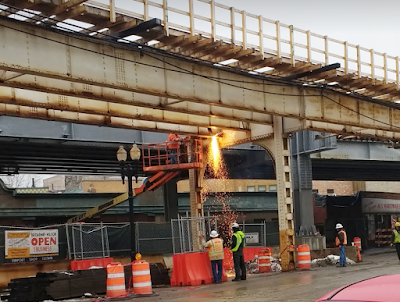 CTA's reps are telling us that the platforms, tracks, entrances and exits (including escalators and elevators) should be substantially done by the end of September, and the renovated Gerber Building should be done by January. It's been two and a half years since the ground-breaking, and while it's been entertaining to watch the changes, we're ready for it to be over, and start enjoying the amenities of a new station. Here are the last of the old tracks being taken down a few months ago.